The team posed for a photo at Jeff Geiger’s barn recently. 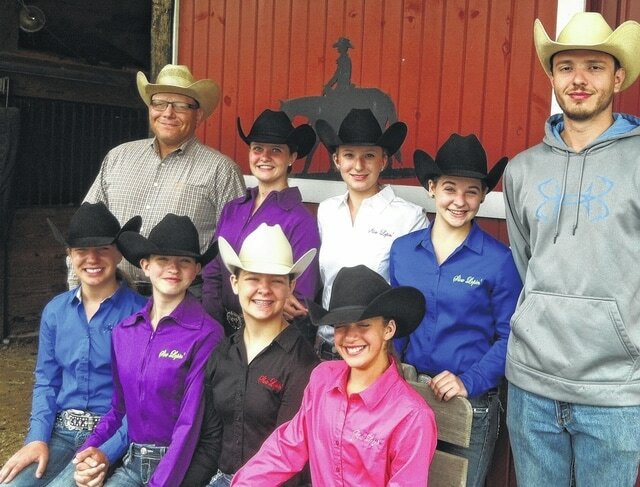 From left to right are (back row) Jeff Geiger, Kristen Rudlaff, Riley Geiger, Keegan Lammers and Ryan Geiger; and (front row) Kylee Williams, Jane Boyer, Kassidy Lammers and Lainie Hilaman. Delaware resident Jeff Geiger’s middle-school IEA team has made history in its first year of competition. An IEA team is a part of the Interscholastic Equestrian Association. This program is unique because it does not require participants to own their own horses. Rather, horses are provided for the competitions and are randomly assigned to participants. To prepare his team to ride horses they have never met before, Jeff Geiger tries to expose his team to many different horses during practices. “Jeff pretty much just tells us to go saddle up this horse and go,” said Kylee Williams. Team members said it can be intimidating to ride random horses, but that doing so has improved their faith in their riding ability. “I’ve learned to trust Jeff’s word,” said Lainie Hilaman. “He says a lot, he’s not going to put us on something we can’t handle,” added Jane Boyer. The national competition will be held in Oklahoma City. To cover the expenses of the trip, the team — made up primarily of Delaware County youth — has turned to local and even national sponsors. “It was really cool to see everyone come together and support us,” said team member Keegan Lammers. Geiger’s high school IEA team did not qualify for nationals this year, but that fact does not seem to have decreased the excitement they feel for the middle-school team. “Here, we all support each other and I find that very cool,” said Riley Geiger, a member of the high school team. “We call each other sisters and we really are,” added Keegan Lammers. The team will leave for Oklahoma today or Tuesday. On Wednesday, they will see the facility where they will be competing, along with the Cowboy Hall of Fame and the Oklahoma City bombing memorial. “I think it’s pretty important that we educate the kids and they get to see things they wouldn’t usually see,” said Geiger.